Delicious and simple cake topped with the most incredible banana pudding and homemade whipped cream. This is a MUST MAKE! We are getting so anxious for summer here at my house. School is winding down and the fun family get togethers are being planned. With summer on the mind, cream pies never venture far away. Recently, I made a Banana Cream Pie Dip. I am not exaggerating when I say that I could seriously eat that stuff by the spoonful… it is THAT good! After making that recipe again, my mom came up with this incredible dessert. 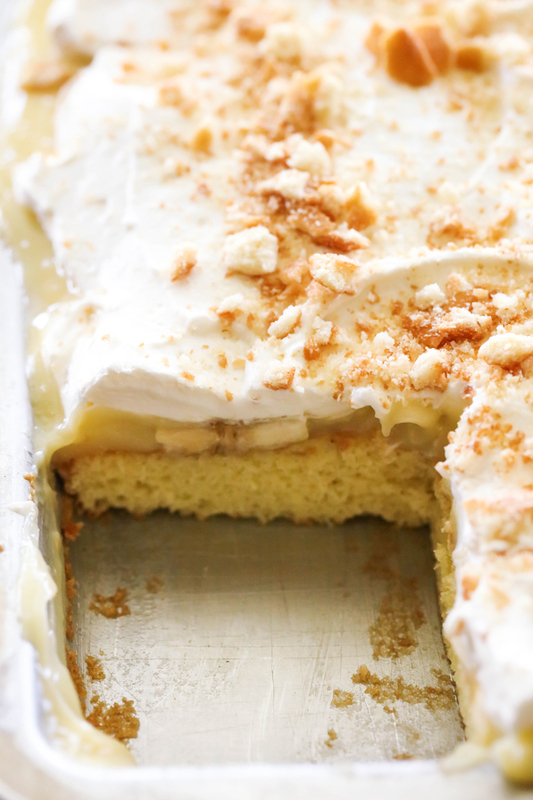 Let me tell you, if you love banana cream pie, you will go crazy over this cake! 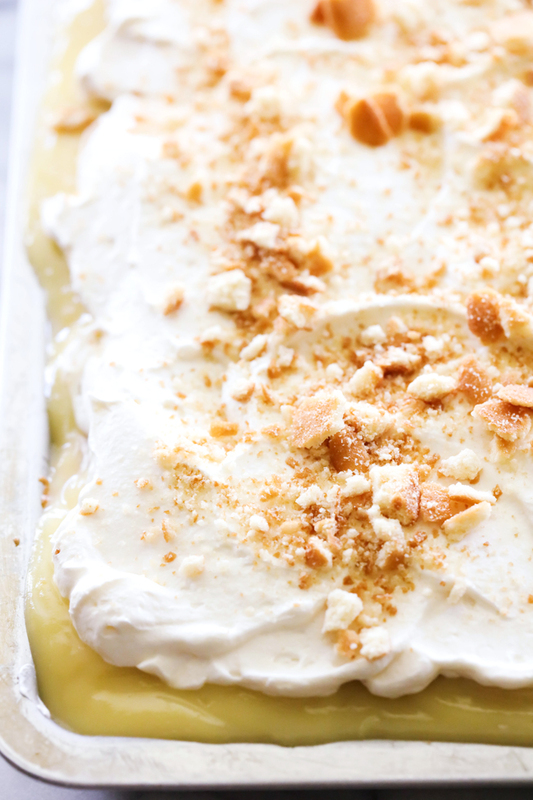 The layers of cake, banana pudding and whipped cream combine to make one unforgettable treat! Pour into a greased 10x15x1 inch cookie sheet and bake at 400 degrees F for 20 minutes. Cool completely. While cake is cooling, prepare pudding. In a medium sauce pan, combine sugar and flour. Add 2 cups milk to the sugar/flour mixture and mix well. In a separate small bowl, whisk egg yolks together and then add to sugar/flour mixture and mix well. Add remaining milk stir to combine. Place pan over low heat and cook until pudding thickens, stirring constantly. Once pudding has thickened, remove from heat and add butter and vanilla. 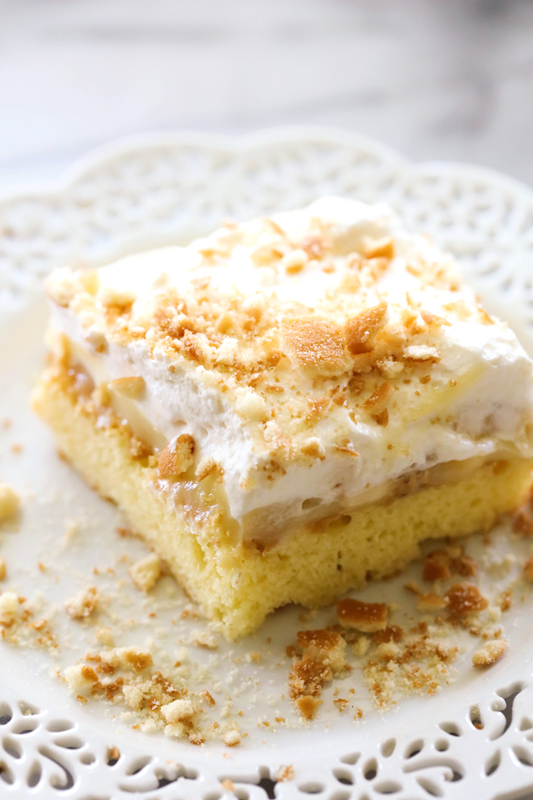 Spread banana slices over cake. In small mixing bowl combine beat whipping cream for 1 minute. Gradually add sugar and beat until stiff peaks form. Carefully spread whipping cream over pudding. To simplify the recipe, you could just make a white or yellow cake mix and prepare according to package directions. What a delicious way to provide dessert for a group! I think I'll make this a poke cake with part of the warm pudding a layer of bananas and then the cold pudding. I made this just yesterday; everyone kept commenting on how delicious it was!